I am halfway through reading Growing object-oriented software, guided by tests, a book that teaches Test-Driven Development in a Java environment. A review will come soon, since the process described in this work is really language-agnostic and interesting also for php developers. a shorter cycle contained in the first, which happens in the phase when an acceptance test is red: you write unit tests and make them pass until the related acceptance test does not fail anymore. This approach is an implementation of Acceptance Test-Driven Development, and in particular makes you write several unit tests for every acceptance test (read for every feature) you want to add. Acceptance testing gives immediate feedback on the application's external qualities: simplicity of use and setup, consistency of the interface. At the same time, unit testing gives feedback on the internal qualities: decoupling, cohesion, encapsulation. test-first paradigm. By the end of the development phase, regression tests will be already in place, and the production code will be forced to be testable. The definition of "done" is very clear (the acceptance test passes), and you are more likely to write only the mandatory code to get a green bar at the higher level. measuring progress is easy: the number of acceptance tests that are satisfied (weighted by points). You can even write a set of acceptance tests for the whole iteration in advance and keep them in a separate suite, moving them in the main suite when they start to pass. 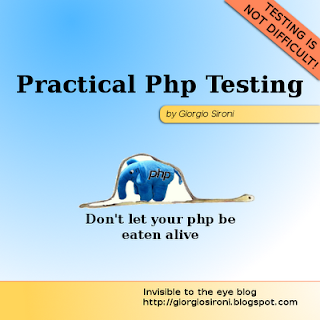 To be a bit more specific, the php technologies I use for the two cycles of development are Zend_Test for the acceptance tests suite and plain old PHPUnit test cases for the unit tests one. Zend_Test is an extension to PHPUnit that lets me define a contract for the http interface of a Zend Framework application, assert redirects, check parts of the html response via css selectors, and even falsify request headers to simulate ajax requests. The unit tests usually have no dependencies on a particular infrastructure, so PHPUnit itself is a powerful enough tool to write them with. By the way, triting an automated acceptance test suite is more difficult than writing unit tests, as there is more infrastructure that gets in the way and a large amount of details that may render the tests brittle. Fortunately Zend_Test takes care of almost all the infrastructure (aside from the database, which I reset in the setUp phase of test cases), and acceptance tests code can and should be refactored to avoid duplication of the implementation details. For instance, Css selectors used to assert on parts of the html response can be stored in constants with an expressive name, and the request creation can be wrapped in helper methods that are composed in actual test ones. Also custom made assertions are helpful in keeping the noise to a minimum. Looking forward to the review. We have this book tagged for our book club for the future.